I apply the same methodology to my sculptures as making a film. I arrange the elements to create a sense of time and movement. In Olympian I used tourism posters of Athens. They tell of something exotic and ancient, we can associate their deep blue colour with travel. I wanted to make something quite abhorrent that could still be funny and charming. The head, which is a painted polystyrene shop model, has paper eyes and teeth. The hat is a teapot lid, and ends of Sellotape rolls have been put together to make a crass version of the Olympic rings. I like to use things that people know what it’s like to handle and experience for themselves, in a way, letting them know they could do this too – it’s not an alien or elite ideology. "Figaro" is a jewelers' term for a weave of chain in which every fourth link is heavier than the others. 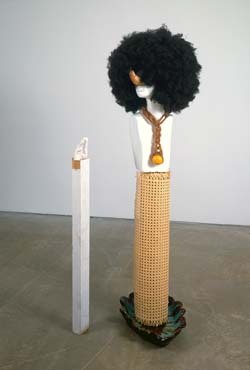 It is also the title of a tall, thin sculpture (all works 2006) by young London artist Anthea Hamilton, consisting of four elements. A small heart-shaped locket dangles on a figaro-patterned chain; this necklace hangs from a long curved twig. The twig is held in place by a small wad of clay attaching it to a chair leg. At the bottom, the fourth part, a metal clamp, functions like a mighty foot to visually connect the whole construction to the floor. Bottom-heavy and gradually tapering from the thick, functional clamp on the ground to the tiny, poetic heart suspended in midair, fragile Figaro is delicately balanced, perpetually on the verge of toppling over. Its fall would be buffered, however, by the expanse of small white porcelain tiles covering the gallery floor and parts of the walls. With its gentle bend and the cheap jewel forever proffered at the top, Figaro suggests a small, quivering suitor, tentatively offering a banal love token. It is a distinctly romantic work, and somehow figurative despite bearing no literal resemblance to the body. It might suggest a frail human figure, but also an emaciated sapling or a piece of junk. Barely stable in its construction, it occupies the floor confidently. Similarly, Hamilton's airy, dramatic hanging sculpture Untitled (Odile) balances almost by miracle. Dangling from the ceiling like a giant Edie Sedgwick earring, it too reaches the floor, in this case weightlessly, on a length of coiled rope. 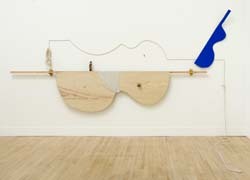 Combining elastic, thin, curved elements and four horizontal bars, the work's emphasis is on the six billiard balls thickly tied to the parallel rods, which look like notes floating on a musical staff. Odile would not appear out of place in a gymnasium, looking, as it does, like a piece of specialized sports equipment--perhaps a training device for a featherlight acrobat. Hamilton's art reflects an interest in weight and counterweight, the unexpected combination of materials, and the human body. Staging the gallery as a tiled bathroom--or perhaps a morgue--the artist enhances our intimate bodily proximity with her highly detailed art. 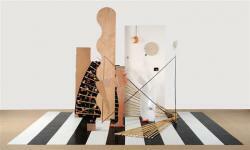 Hamilton's skewed figuration, mixing genders as well as human and mechanical elements, is reminiscent of Surrealism; her use of mannequins, collage, and found objects reinforces this kinship. 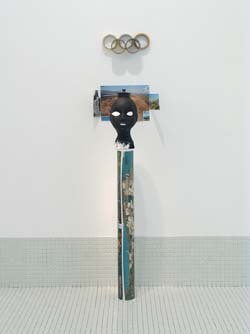 Explicitly figurative works such as Man, built in three distinct parts--cutout wooden legs beneath a rolled-up poster forming a perfectly cylindrical torso with a mannequin's head propped at the top--seem the result of a game of Exquisite Corpse, played in three dimensions.